As I discussed in Part 1 of this blog post series, there is an immune system and allergic reaction component to eczema. As someone who has dealt with quite severe eczema my whole life, I can confirm that allergies have a lot to do with it per my own experimentation with exposure and avoidance of certain triggers. In some respects, eczema sufferers are just people who are hypersensitive to environmental allergens. Eliminate the allergens, and the problem goes away. The way your body produces inflammation is complex. I find that most educational resources that describe the process go into a lot of detail on the specific chemical interactions, which makes it hard to understand. But I think a key takeaway about inflammation in regard to allergy is that it can turn into a perpetual chain reaction like a nuclear reactor or a flame burning through fuel. A few of your cells identify a foreign substance in your skin that shouldn't be there, so those cells respond by releasing antibodies and other chemicals to fight the invader. But these same chemicals also trigger other cells to start doing the same and produce even more of these immune response proteins. Soon, the entire area of skin is producing these chemicals and the inflammatory reaction spreads. In the case of an allergy, your body is reacting to a benign environmental substance like cat saliva proteins for example, which it's trying to purge like it would a virus or bacteria. Once this process gets going it could keep itself going and you have a rash long after you've been exposed to the allergen. It is at this point that your doctor may say it's necessary to "calm it down" with the use of a topical drug. The video below describes how the drug Eucrisa is thought to work. It interferes in this reaction, blocking some of the immune system signaling proteins, and thereby stopping the chain reaction of inflammation. Basically most drugs used to treat inflammatory response work similarly by interfering somewhere along the chain of chemical reactions. Although drugs may be necessary sometimes to calm eczema down, I find that the best way of staying healthy is to avoid allergy triggers altogether. Sometimes it is difficult to pin down your specific allergic triggers as every person's case is different. I hope this brief list gives you clues on where to begin experimenting to find your own triggers. In my early 20s around the time I met my future wife, I started getting a really bad series of eczema outbreaks all along my arms. My left arm especially was covered in itchy red rashes. I went to multiple doctors, and got the usual treatment of triamcinolone, which only worked briefly before the rashes ripped right back. They tried more powerful creams like fluocinonide and the problem kept getting worse. 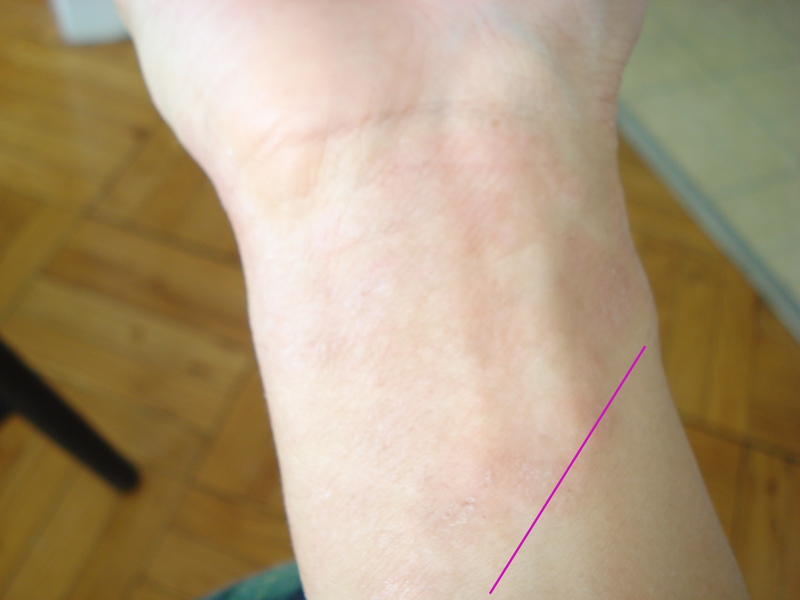 It wasn't until one dermatologist I visited noticed that the rash on my wrist seem to fall in a perfectly straight line. She asked me what I do that I might be rubbing against something causing me an allergy. She told a story of another patient with a similar case of hand eczema, and they figured out that that patient had an allergy to the chemicals in money and it was the way she would hold dollar bills that caused the rashes on her hands. After much thinking, we suspected that the rash on my wrist might be from the way I would play with my wife's hair when we're walking around the streets of Chicago on our dates. We scrutinized her shampoo. A patch test confirmed that I was allergic to Pantene. My dermatologist said that shampoo allergies are actually a common thing people end up getting treated for. Over the years we've experimented with several shampoos to see what I'm allergic to. I've switched to the Free and Clear brand of shampoo, which is supposed to not contain a lot of the toxic ingredients of the big brand shampoos. The common ingredient that I could find causing me trouble is cocamide DEA, an agent used to help the shampoo produce those frothy bubbles when you rub it in your hair. I'm not 100% certain if that's the only problematic ingredient, but it does seem to have a correlation. I've known since I was a kid that cats in proximity cause me to have watery eyes and a stuffy nose. But it was only in recent years that I learned they can cause me dermatitis outbreaks as well. On a prick test when I was 23, I was told that I had an affirmative reaction to both dog and cat proteins. Several years later I decided to fight through my allergy and tried petting a cat that approached me. After a few minutes, my arm broke out in hives and in the following days I got a pretty nasty dermatitis rash. It didn't kill me, but it didn't make me stronger either. More sneaky is my allergy to dogs. I really like dogs, but unfortunately I can't interact with them a whole lot without getting a dermatitis rash. I say it's sneaky because I've figured out that when I pet a dog, the rashes don't manifest until at least a day or two later. Wearing disposable plastic gloves seems to work in preventing the rashes if I want to pet a dog. A less examined link between chronic eczema and allergens is food allergy. Allergens you ingest could manifest as a skin rash, making it very difficult to see the link. However, there's a growing body of scientific evidence demonstrating this, such as this case study by the NIH showing a link between patients who suffered from dematitis rashes and the consumption of nickel in their diet. Nickel is often absorbed through whole grain breads and oatmeal. In my case I discovered that I have an allergy to coconut. I really like the taste of coconut, so was shocked when I figured this out, but it makes sense since it could be related to my allergic reaction to cocamide DEA in shampoos. I first started suspecting this when I noticed that the sweat I'd get during workouts seemed to cause a lot of itching and later dermatitis around my neck. It was hard to deal with because I didn't know exactly what to do about it. It steadily became more of a problem over a 2 year period. I started to wonder what if there's something in my sweat that was causing the problem, like a food I've been eating that's getting sweat out during the exercise. What have I been doing differently lately that it's becoming more of a problem than before? I started making pre-workout smoothies with coconut water and various fruits. So I tested this out by eliminating all coconut from my diet, and this seems to have worked. If I eat anything coconut like coconut milk or coconut water I start to have some eczema problems in the following days. This was a tricky one to figure out because like the cat and dog allegy, there is a delayed reaction and the symptoms aren't so severe right away that it forces me to notice the link in an obvious way.